I was in Venice the other day and it was really hot. OK, it was 15 degrees Celsius, which, strictly speaking, is not that hot at all, but the sun was shining, the sky was blue, I was carrying a heavy bag and I spent hours walking around. So, pretty soon I started to feel really hot to the point where I stopped worrying about what the always appropriately dressed for the season Italians might think of me, and took my thick jacket off. ‘So you should’, I said, eager to cut the conversation short, and then I quickly retreated in the general direction of the museum’s ticket office. And then I had a little revelation. Suddenly I realised that my way of travel was not that guard’s way of travel. That we both had different expectations and the fact that I am happy to traipse round museums and explore cultural and historical sights for days on end in order to feel like I have properly seen and fully experienced a place, didn’t mean he had the same inner need. Yet, we both have the ability to travel and to get from point A to point B in Europe (or anywhere in the world for that matter) relatively cheaply and easily. And as we both pay for our own travel, there is no-one – an official body or other such recognised institution – to judge which way of travel (mine or his) is the right one. It was a totally random conversation, yet the thoughts and the understanding it gave me, finally made me sit down and write this blog post, the topic of which had been playing at the back of my mind for a very long time. Without sounding too dramatic, it would be safe to say that never in the history of the world people have had the chance to travel so freely and so quickly as today. We all can get on a plane and within a matter of hours reach a place which was almost completely removed from the reach of the generations before us. Travelwise, we have it all on a plate and, as long as we have the time and the financial resources, there is not much stopping us to go out there and explore. At the same time, we still think about travel mostly in the romantic terms of the days of yore. We see travel as this great, entrepreneurial thing to do which gives meaning to our lives, enriches our souls and helps us find ourselves. Yet, when you look through the cracks of this grand statement and sentiment, you soon start to see that the reality (or even realities) of modern leisure travel is a bit different. So, here I will try to summarise the new attitudes and expectations affecting travel nowadays. These are behaviours you may have noticed displayed on social media or they may have jumped out at you in conversations with friends and relatives who love to travel and/or do it often. I am not going as far as to brand them as ‘bad’, ‘good’, ‘destructive’ or ‘positive’, as these are new behaviours shaped by the breathless, social-media-obsessed world we live in. What is going to be their long-term impact still remains to be seen. Plus, in any case, what follows below are just my personal observations and thoughts. In the ideal case, everyone should have the right to travel just the way they see it fit. Still, as this is not a perfect world, we need to be aware of how we behave in it and what repercussions our behaviour has on the environment we are in. This is even more valid in the case of leisure travel, when we leave our comfort zone behind in order to explore a completely new environment and every interaction we have with and within it has the potential to make or break our experience. In this real, not-perfect world certain changes in our understanding of travel and in our travel practices are taking rapid shape and, I believe, it is useful to note them down, describe them as fully as possible and, generally speaking, keep an eye on them in order to see how they will affect leisure travel in the years to come. I would be really interested to hear your opinions on the matter. I understand that you may agree or disagree with many of the points below. It would be really helpful and quite exciting to open a wider debate on this topic and take in consideration the views and opinions each one of us has. This seems to be the most powerful shift in our travelling behaviour. Surrounded by striking visuals through social media and marketing campaigns, we are easily influenced by dreamy imagery and become desperate to reproduce it ourselves. Hence many people make travel-related choices based on a picture they have seen in the media and/or online. Then thousands of travellers descend on the same spot and try to replicate those perfect photos themselves in order to post them online and attract as many likes as possible from family and friends. It is like achieving travel validation through re-capturing the beauty of a place which has been marketed to us by digital influencers and PR campaigns. We all seem to want a photo from the same angle, with the same vibrant, saturated colours, with the same blue, unblemished sky. In our desire to replicate images, which we have seen somewhere else, we may even develop unrealistically high expectations of a destination and then become bitterly disappointed when we realise, once we have reached it, that in reality it doesn’t look as picture-perfect as the photos of professional photographers in travel magazines and blogs have had us believe. Still, amazing images promising unmissable experiences seem to be the most powerful travel stimulus today and we all will keep being seduced by the idea that we can replicate it all for ourselves. Just like the people in the photo accompanying this article, which shows the crowd of people on Rialto Bridge in Venice trying to get an iconic picture of the Grand Canal. How tourist boards and travel bloggers can capitalise on this? An easy and immediate solution is to put up signs leading to the specific spots from which iconic shots can be taken. Bloggers can publish lists with the best angles to photograph a world-renowned city, sight or event. Another approach would be to create location- and destination-specific hashtags and travellers to be constantly reminded of them and stimulated to share their own photos with these hashtags. It sounds a bit extreme, but it seems to be happening all the time. It has become increasingly important to people to be able to show their friends and families where they have been and what they did there (down to the last cup of coffee they sipped). We all seem to want the social validation of being seen posing in front of popular sights or doing fun, exciting stuff. In our attempts to achieve a maximum number of likes, we want to optimise the number of photo-worthy locations we visit. Hence the mass appeal of instagrammable coffee shops, markets and even unusual doors and walls. At the same time a smaller museum where the light may not be right for selfies or where photos are not allowed may not be included in the traveller’s itinerary at all, in spite of the incredible works of art it may own. How tourist boards and travel bloggers can capitalise on this? Local tourist boards can work with local photographers offering to take candid photos of you while you explore a destination. Museums need to relax their ‘no photos’ policy where this has been introduced only with the intent to stimulate sales of the museum’s postcards and books. Museums need visitors more than ever and offering a chance to take photos (even against a reasonable fee) is one way to attract steady footfall. Travel bloggers can compile blog posts with the most instagrammable spots in a particular country or place. Or, on the other hand, they can recommend visiting unmissable places of interest even if photos there are not allowed or not advised. Or we do a very superficial one. Having seen a lovely photo or heard from a friend that they have had a fabulous time at a particular destination, nowadays seems enough to make us want to go there without knowing much about the destination otherwise. A few days ago I had an informal chat with a professional tour guide working in one of the world’s most well-known and desirable from a travel point of view cities. She said something which made a big impression on me: ‘Our city is so well-known that everyone wants to visit in their lifetime, not necessarily knowing why they want to visit and what to see and do here.’ Sad, but true. The ability to book a flight and then spend a day or a week at a particular place doesn’t necessarily translate into a real, conscious need to learn as much as possible (or, at least, the bare minimum) about the place. Perhaps we expect that as soon as we arrive, welcoming locals will take care of every need we have. Or, perhaps, we think that if we miss something important to see and do there, we can always go back some other time. It could also be that we are not interested in the local culture at all and just want to say that we have been there and ticked that particular place off our compulsory bucket list. And, lastly, it could simply be that we are completely overwhelmed with information and things happening in our lives and just want to travel somewhere and relax for a bit without delving too deep in the reality of the new place. How tourist boards and travel bloggers can capitalise on this? By offering easy-to-read, simple and to-the-point information freely from the point of arrival to the point of departure. By posting online sample itineraries and city/country guides, and constantly highlighting on social media and in blogs what can’t be missed in that particular country or place. Or to impress them. Thus travelling becomes a never-ending game of catching up. We all keep going to the same places and having the same experiences as everybody else around us. We hear from other people about the places they have been to and in line with our human tendency to outdo each other, we make it our goal to go there ourselves. Sometimes though it happens that by the time we have finally made it to a place, it may be past its sell-by date and we can’t quite fathom why thousands of other people have raved so much about it. Yet, when the time comes to pick our next destination, once again we get ourselves easily seduced by places where people we know have already been to. Travel envy is a real thing! How tourist boards and travel bloggers can capitalise on this? By making sure that they have systems in place to capture travellers’ first-hand reviews about the places they have visited. By flooding the social networks with stunning imagery of the places they promote in order to stimulate wanderlust. By creating hashtags and encouraging people to use them on their own photos and social statuses and thus to spread the word about a place among their social contacts. By making sure that there is a tight collaboration between tourist boards and travel bloggers in order to promote widely a certain sight or a place in front of a wider audience. There are apps helping us count all the countries we have been to (even if it were for an hour-long stopover). And there are countless of travel bloggers and travellers whose social media profiles sport a line like this: ’87 countries and counting!’ It could be that the higher the number, the better is the perceived value of your travel experiences, still this constant number-chasing may also lead to a feeling of failure if you can’t tick off a new country every month or so. How tourist boards and travel bloggers can capitalise on this? There are two options here, really. One is to develop quick yet exhaustive itineraries, promising to give a good taste of a country within a limited number of days, so that people get seduced to travel there and increase their visited countries’ number by one. The other approach would be to accentuate the value of slow travel, of engaging with the local culture and way of life in meaningful ways, instead of rushing through it all like there is no tomorrow. It seems like most of us are happy to simply follow the crowd and visit the same old places over and over again. There is a certain travel comfort zone which is very hard to break through. After decades of clever travel marketing techniques, millions of people all over the world dream of visiting the staples like London, Paris and Barcelona, somehow believing that they would miss a lot if, instead, they opt for lesser known or completely unknown places. The cool factor attached to travelling to a place which everyone knows about is hard to beat. So, it becomes difficult to break this flock mentality and bravely go explore countries and sights which are off the beaten path and on no-one’s radar as of yet. How tourist boards and travel bloggers can capitalise on this? Don’t forget that for every travelling sheep, there is a person eager to escape to places which are still unspoilt by the mass tourist/traveller. Also, just because at some point in our lives, we have felt the need to visit a city which is nothing more than a social media cliche, as time passes by, our interests and our decision-making process change and we may become more open to travelling to a place which is not widely known. Hence, tourist boards should keep publicising their local cities and sights, highlighting what makes them unique and worthy of a visit. Apparently, it takes seeing something or hearing about something seven times before we would consider it as a viable option. So, even though it may feel disheartening at first, keep promoting your destinations in a consistent way. Travel bloggers could focus on discovering new, unmissable places and thus start trends. It sounds crazy, yet a large number of people go abroad fully expecting their needs to be accommodated just as back home. Lacking an understanding of foreign cultures, yet possessing the financial means to travel to foreign lands, such visitors will either be disappointed and/or baffled by their travelling experience or (if arriving in large enough numbers) will stimulate the creation of specific services which cater to their precise needs. In support of the first case, I would like to quote a complaint I once read on a hotel review site. It was left by a Scottish person about a hotel in France. It went along the lines of: ‘Breakfast was very disappointing! There were no sausages, no black pudding, no eggs, no…’ And the person went on and on, enumerating in great detail every single segment of the traditional Scottish breakfast and lamenting the fact that it was not offered at the French hotel. Now, to travel to France and to complain that a chain hotel is not serving what you may expect to be served back home, may sound absurd, but it illustrates perfectly that being financially able to travel doesn’t equate being culturally aware and prepared to travel. In support of the second statement I made above, I would like to mention the many British-like shops which have popped up in parts of Spain predominantly visited by Brits. There you can easily find things like proper British fish and chips, greasy spoon cafes and so on. Which on one hand makes it easy for the visitors to feel at home, but on the other hand it doesn’t in any way bring these same visitors in contact with the authentic local culture and way of life. How tourist boards and travel bloggers can capitalise on this? It is a very slow process and often you will need to choose your battles carefully, but if you don’t want to focus on cheap and cheapening types of tourism (like alcohol tourism, for example), a lot of effort and finances need to be sunk into the constant and innovative promotion of the local culture and the reasons it is unique and worth experiencing. In a way this may seem a repetition (or a supporting subpoint of points 3 and 7 above), but it is worthy of us analysing it on its own. We travel to Italy and complain that shops and institutions (especially in smaller cities and the countryside) seem to shut between 1 and 4 pm each afternoon for the traditional riposo break. We visit the Plitvice Lakes in Croatia and swim in them (which is strictly forbidden). We visit Spain and binge drink instead of enjoying a slow and conversational drinking process over a selection of tapas. We try to visit a church and are shocked that we are politely asked to leave as our summery outfit is quite revealing indeed. We plonk ourselves down at St. Mark’s Square in Venice to eat a sandwich and get all mouthy when told that picnicking is not allowed there. It is the lack of knowledge of such local expectations and rules which can completely spoil a travelling experience and can also land us in trouble with the local law plus incur a sizeable fine. As it is quick and easy to buy a last minute ticket to anywhere in the world and as it takes a lot of time to research local customs and etiquette, it is to be expected that the number of such mishaps will only increase going forward. How tourist boards and travel bloggers can capitalise on this? Our most important task is to constantly educate. It is a never-ending process where repetition of the same things over and over again is bound to, sooner or later, yield results. Even putting up signs or distributing leaflets explaining local traditions and behaviours is a step ahead in order to tell travellers what is expected of them. But the education process needs to start longer before the actual visit to the respective country. Through social media, videos and blogs, people need to be made aware of how best to enjoy the local culture without incurring angry glances, confrontations or violations of the law. We have become so obsessed with reading and checking reviews that often we refuse to eat at a place or sleep in a hotel which haven’t been recommended by a million other travellers on the popular review sites. We are constantly looking for suggestions as to what to do, where to go and what to experience when we are abroad. To the point where some of us may even compile extensive itineraries, noting down hour by hour what we should be doing and how. This approach (organised as it may look) has the big disadvantage of killing spontaneity. And being spontaneous is one of the most charming qualities of travel. So, instead of simply walking into the first eaterie which catches our eye, we are prepared to walk for miles trying to find that one particular restaurant which was recommended by somebody to us. Instead of visiting smaller museums off the beaten path, we are prepared to wait for hours in order to visit the most famous museum in town, just because everybody else goes there, too. And, instead of finding our own viewpoint to take a picture of what’s in front of us, we are quick to stand right next to the person snapping photos with the biggest camera in order to replicate the angles chosen by him. How tourist boards and travel bloggers can capitalise on this? By making sure that they capture as many reviews by visitors as humanly possible. Visitors should be encouraged to leave reviews on social media, on the popular travel review sites and on the sites and blog posts of the tourist boards. Also, by constantly offering advice on what to do and what to see in the particular areas. We are so painfully aware of the huge number of countries and places to see before we die, that we have become only too happy to pay a rushed visit to a place and then tick it off our bucket lists with the satisfaction of a job well-done. Hence the proliferation of guided tours promising to take you through five or six countries within two weeks. You stop at certain spots along the way, follow the tour guide like a faithful flock and upon returning home, you proudly show pictures of all the places you managed to cram in to everyone who would spare a second to look at them. Short city breaks are very popular, too. In two or three days we see the best a city can offer, visit a museum or two, eat in a couple of renowned restaurants, perhaps spend some time at the hotel’s spa and take countless photos of cocktails and cups of coffee with a chocolate croissant. Then, it’s time for our next adventure, as obviously we have seen and done all there is to see and do at that particular place. Happy to glide on the surface of our host nation, we rarely stop to delve into the rich layers which lie underneath. Anything that is not snazzy, glitzy or instagrammable is left aside for ‘next time’, as we like to believe that we will return to this place, as we loved it so much. Instead, in our heads we are already planning our next trip which, once again, will be short and sweet, allowing us to pick and mix just what is visually pleasing from whichever place we decide to visit next. How tourist boards and travel bloggers can capitalise on this? Either by taking the obvious route, which would be to cater to this breathless exploration of the world, and thus offer quick and easy itineraries covering the must-see sights and the must-eat food in a particular place. Or (concurrently) promote slow travel and its benefits by providing information about all the unmissable things a visitor can do and which need more than a day or two to be properly experienced. When we travel, our main preoccupation seems to be how easy it would be to find wifi and get connected to the internet when we arrive. Roaming charges can be expensive and those social media accounts don’t get updated by themselves. Hence we base our choices in terms of hotels, cafes and restaurants on the availability of free internet connection which must be very high-speed. There is nothing more natural than to tweet from the beach or to post selfies from historical, archaeological and so on sights. We need to be able to do it for our travels to feel complete. We can get pretty frustrated if the opportunity to go live on Facebook from wherever we are in the world is denied to us. How tourist boards and travel bloggers can capitalise on this? By providing the opportunity to use internet for free all through a city or a town (just think about the huge marketing exposure this will gain you with the thousands of visitors posting their last selfie from the destination promoted by you). By posting destination lists with places where internet can be used for free or for a nominal fee. Hence we ride elephants and stroke tigers in Asia. We get undressed on the top of sacred mountains completely unaware of the offense we cause. We may even go as far as sampling whale meat or other such ‘delicacy’ in the countries where they are sold. Points 3 and 8 of this list come heavily into play here. Still, the lack of knowledge about the consequences of our actions may make us exempt of guilty conscience but it doesn’t save us from the reach of the local jurisdiction. How tourist boards and travel bloggers can capitalise on this? 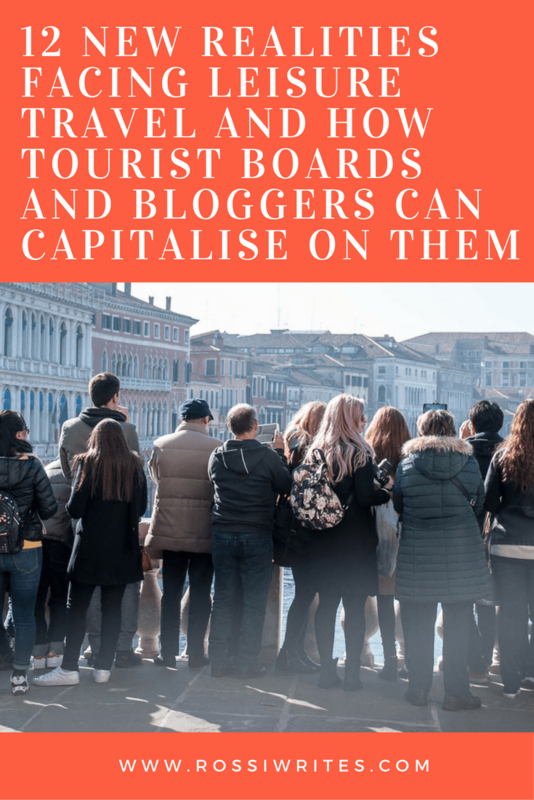 ‘Capitalise’ here is not the right word, but both tourist boards and travel bloggers need to constantly educate travellers about what is considered acceptable and not acceptable in the respective countries they promote and/or write about. Bad practices in terms of animal torture need to be combatted on all levels of society. Here you have them – the 12 new realities facing leisure travel and some suggestions as to what tourist boards and travel bloggers can do to capitalise on them. What do you think? Or, is there anything else you would like to add to the list? Let me know!